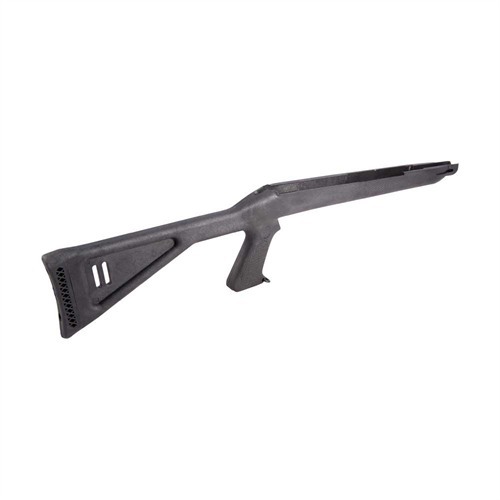 Faster handling and faster pointing than conventional rifle stocks. 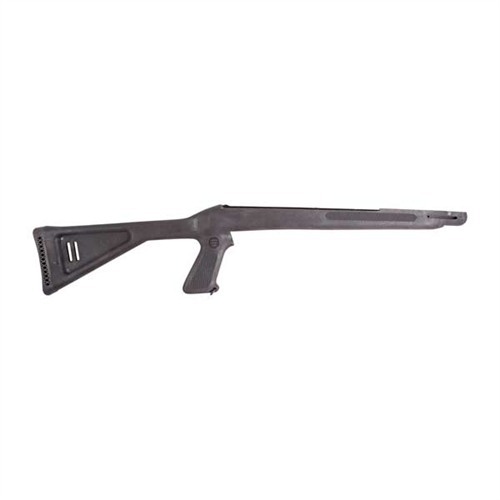 ¾" longer length of pull than the factory or issue stock gives increased shooting comfort and a better fit. Drop-in design means no fitting required. Made from lightweight DuPont Zytel® plastic for the ultimate in stability and strength. All models include 1" rubber recoil pad and 1" sling swivel loops. It will only fit Military version of the M1, will not fit the universal model M1 or non-mil spec clones. SPECS: Zytel plastic, black, textured finish. 29" (73cm) long, 1lb. 6 oz. (632 g) wt. Raskere håndtering og raskere peker enn vanlig rifle aksjer. ¾" lengre liggetid trekk enn den fabrikk eller problemet lager gir økt skyting komfort og bedre passform. Drop-in design betyr ingen montering nødvendig. Laget av lett DuPont Zytel® plast for maksimal stabilitet og styrke. Alle modellene har 1" gummi rekyl pad og 1" slynge dreibart ledd. Det vil passe militære versjon av M1, vil ikke passe universell modellen M1 eller ikke-mil-spec kloner. Spesifikasjoner: Zytel-plast, svart, strukturert overflate. 29"(73cm) lang, 1 lb 6 oz. (632 g) wt. I bought this for an Auto ordnance M1 Carbine. It has a good profile. It gives a longer length of pull which for tall guys like me Is a god send. It feels more like a normal rifle while still remaining light and handy. With a synthetic stock the gun is now less prone from changing zeros and group shift due to humidity and rain. The built in sling mounts are convenient and do not require the oiler bottle to use. The overall quality was so so. The stock came with moulding flash still on it, it was incredibly tight to get a receiver into and needed some sanding. It is not a well finished product. It does clean up nice but you will have to hit it with a file and sandpaper. 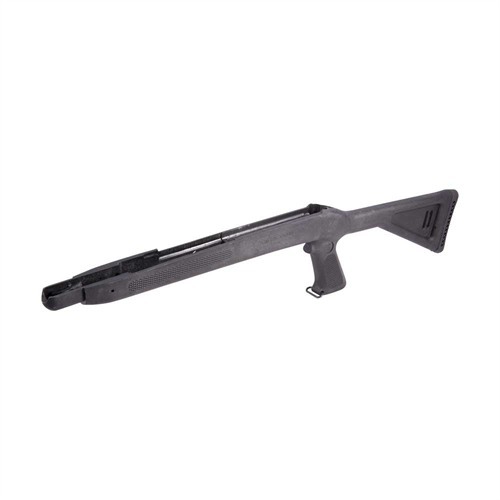 the stock profile is not compatible with auto ordnance upper hand guards, If you have an auto ordnance model, fear not; with a standard GI profile vented steel upper handguard available off brownells you are good to go. You will have to dremel the stock to get a scout rail handguard to fit. the stock did not come with a rear recoil lug. You must provide your own which means buying one aftermarket or stripping it off your own M1 stock. It is not compatible with the recoil lug from Auto ordnance, Plainfield, or Paratrooper stocks. yes I tried all three to no avail. it also requires a barrel band retaining spring. I wish these requirement were listed as a requirement on the product as i had to put in a second order to get them. First off, it is not compatible with paratrooper recoil lugs. 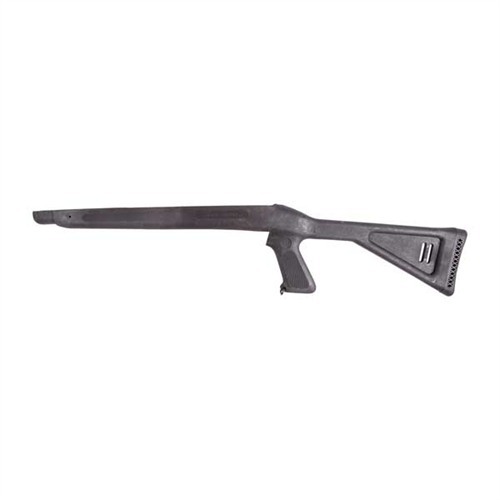 Nor is this stock compatible with Auto ordinance upper hand guards. This stock is tight, you need to beat the recoil lug in with a mallet. you also need a rubber mallet to get the receiver in. once the receiver is inserted into the recoil lug and you cam it down, it will stop with the forend 2 inches away from the barrel where the band sits. you either need to bend the stock and it will put about 30-40 LB of pressure on the barrel band... or you need to mill out the stock. You can do it with a dremel and a file but its going to take a long time. Its much easier in a end mill. you need to remove 1/16 to 1/8 of material along the receiver supports, remove material around the trigger assembly, mill the recoil lug pocket out so that it sits flat and square. and a few more points of contact that well... shouldn't be contacting. It is a lot of work. Once that's done it looks nice, feels nice, and is a more comfortable sitting stock for tall people like myself.